No, that headline is not a typo. 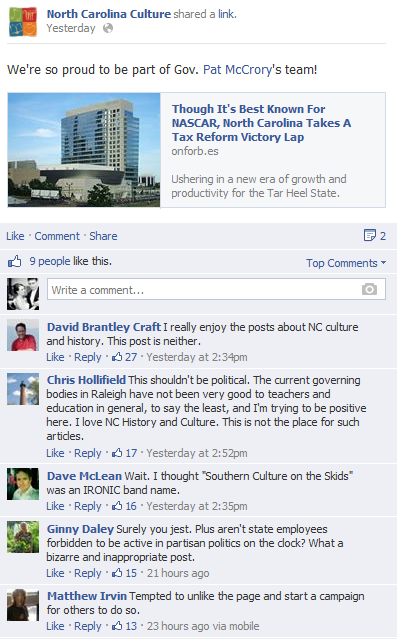 North Carolina’s Department of Cultural Resources — you know, the folks with the mission to enrich lives and communities and create opportunities to experience excellence in the arts, history and libraries in North Carolina — has a post on its Facebook page in which it touts the state’s new and regressive tax changes and links to a Forbes.com article on the subject. 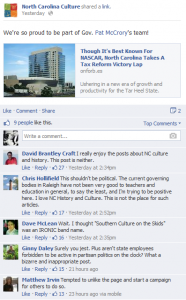 I suppose you can chalk it up to loyal administration staffers simply cheerleading for the people that hired them, but the post has ticked off a heck of a lot of Facebook commenters who are used to coming to the page to read about, you know, cultural issues. As of Thursday afternoon, 63 people had commented. No word yet on whether the Department will be offering up any virtual cookies for its large group of disgruntled friends. Thank you for making these remarks. State employees should not feel obligated to praise the political machine which has the helm at the moment. I suspect it is the Governor appointed Secretary who must take credit for the comment about the “team”. Totally inappropriate. One might wonder who requested the post–and the price . . .
We should be touting this great acheivement. This will help our economic growth and start getting us competitive and exceeding the states in our region.